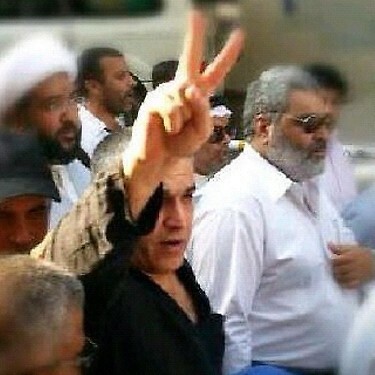 URGENT UPDATE: Nabeel is now in prison on hunger strike without water, food or medication. Doctors warn he may die in days! All he wants is to visit his mother's grave, to complete 3 days of mourning. Please do what you can to help. If he dies it will be a disaster for Bahrain and mankind. 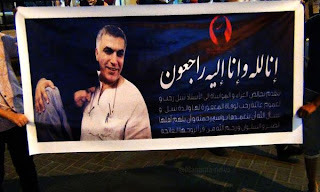 News broke on the morning of 4th October 2012 that the dear mother of Nabeel Rajab, director of the Bahrain Center for Human Rights had passed away during the night, whilst he was locked up in prison for a Tweet. He was allowed to attend her funeral that day but then forbidden to meet people for condolences the day following despite being told he would be given 3 days for mourning, due to the following speech. "I thank all those who came to give their condolences. And I call upon everyone who has a shred of love towards me or my mother, who died crying wanting to see me. But regrettably..this oppressive regime, this tyrannical regime has prevented me from being with her during the last moments of her life..It is my request and that of my mother for the good people of Bahrain not to retreat. We have rightful demands, rightful values, rightful principles. This regime is dictatorial, this regime is oppressive and it is our duty, legitimate and moral duty to resist injustice and strive for democracy. And I call on everyone, everyone to attend every protest and specially those held in Manama (the capital)..that is our greatest challenge. I call on every man and woman, and I am following up from inside prison on all the news. In the last protest I haven't seen women protesting with Sheik Ali Salman in the newspaper or maybe the picture that was posted didn't show it clearly but its my request and my appeal to all those heroes to be present in Manama and everywhere. In defence of their rights, dignity and principles. And this is our challenge, if we couldn't manage to earn our rights during this period we never will. We will prove that by God willing even if they throw us in prison or kill us or our families we will not retreat and we will be victorious against this oppressive regime, God willing." 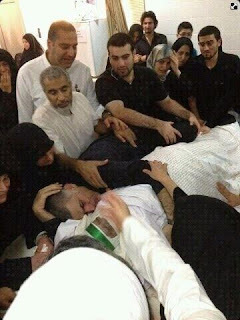 Nabeel Rajab speaking at mother's funeral. 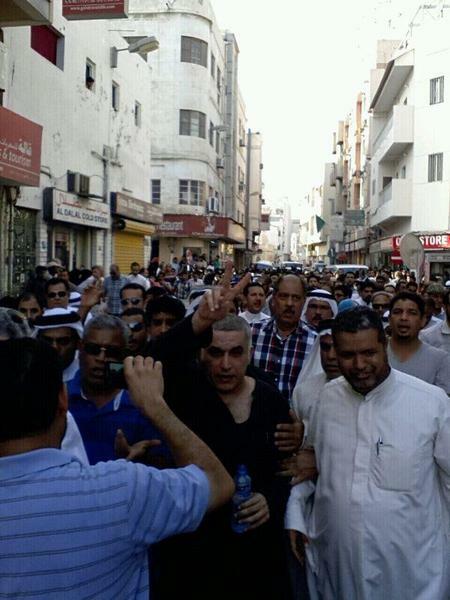 Nabeel was very close to his mother, who was always waiting for his safe return after demonstrations. Nabeel says his last goodbyes to his dear mother. Despite his grief shows his strength at his mother's funeral. Zainab Alkhawaja @angryarabiya released after 2 months in prison just the night before after being severely beaten by police, at Nabeel's side. 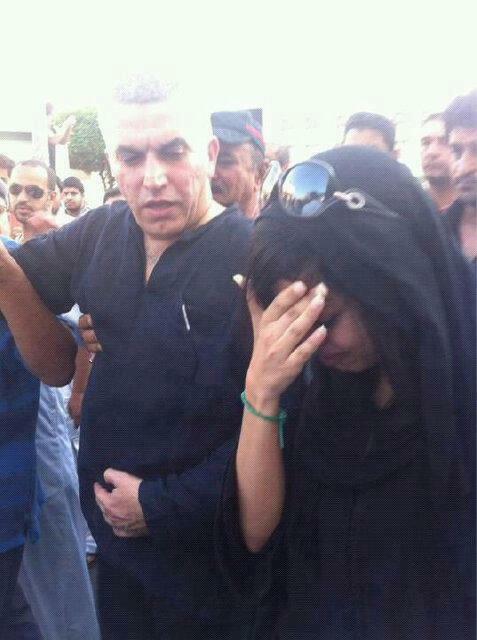 She is always to be found standing next to the victim of Bahrain, sharing their pain. The epitome of humanity and compassion. Nabeel's mother symbolised a mother of all the oppressed people in Bahrain, and all the people felt great sorrow at her funeral. Banner at Manama protest that night. More details on Nabeel's prison sentence and situation can be read here.